Winston Churchill was quoted as saying: “Success consists of going from failure to failure without loss of enthusiasm.” Your success in electrical estimating is all about your MINDSET. You must go from one failed estimate to the next, with equal enthusiasm. Just because you lost a bid does not mean that you did anything wrong! The fact is that you will only win a certain percentage of the bids that you submit. If you have a very high bid/win ratio, then you are probably bidding too cheap. (1) Completed the material take-off. (2) Received your quotes for materials and from sub contractors. 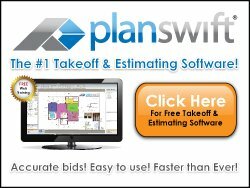 (3) Entered all items into your electrical estimating software. (4) Conducted a Bid Review; and made the necessary changes. (5) Developed an exact cost including Overhead and Profit. (6) Created and sent off your bullet-proof proposal. ...hopefully your customer says: "Congratulations, you were the successful bidder." Now what? Without a proven systematic estimating approach, your first thought might be - OH MY GOSH, WHAT DID I LEAVE OUT? When you forget to include some cost of the project or, as it is referred to in the industry, “Leaving something on the table”, you will likely win the bid. When you win a bid like this, that is when winning the bid is not winning at all. Let’s face it. In a “low bid wins” business, sometimes you get a little gun shy after you bid a job and win it because you may have left something out. In order to ensure that you have included everything in your bid, you set up checks and balances to insure that you “Dot the I’s and cross the T’s”. Make up your mind to work systematically on your estimate, start to finish with lists and check lists, checking every item along the way. Thus the term Systematic Electric Estimating! Develop the right attitude - Having the right attitude is knowing that successful results come from consistent, immediate, intelligent, persistent action! When you lose a bid, pick yourself up, go for a walk around the block, take a 5-minute relaxing break, and then GO BID THE NEXT ONE! The psychology of less-than-a-dollar pricing - It is strange and interesting how the less-than-a-dollar pricing affects peoples perspectives. Example: $9.99 is less that $10.00, just like $999.00 is less than $1,000.00. A great amount of research has been conducted to understand this phenomenon. The fact that all major corporations use this pricing strategy in massive advertising efforts is proof enough that it works. Consider this, if your complete bid comes to $10,050.00, the bid should be rounded down to $9,995.00 or $9,997.00, or $9,999.00. If your customer has a budget in the $9,000.00 range and your price is $9,995.00, then your price is still in his range. If your price is $10,050.00, then you are over his price range and may not be considered for the award of contract. It is amazing how well this works. Using the less-than-a-dollar pricing strategy gives you a psychological advantage when bidding jobs.